Elegant. classic. Timeless. They are words that sum up the artistry of wrought iron and the presence and impact they bring when featured in homes and businesses. 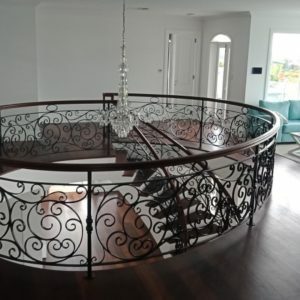 Across Brisbane, the Gold Coast and the Sunshine Coast and further afield, Dean Wilson Iron are south-east Queensland’s premier wrought iron craftsmen, and the team behind some of the most intricate iron creations in homes and business alike. Whether it’s classic garden fencing, grand entrance gates, railings and other decorative iron artistry to accompany your indoors or outdoors, using wrought iron brings a sought after appeal to any property, working alongside with existing materials and architecture. The malleability and blacksmithing background of the team at Dean Wilson Iron makes creating intricate designs easily achieved. With no job too big or small, the workmanship of the Dean Wilson team can be found across Queensland. Between the sandstone columns of Rockhampton’s 18th century St Joseph’s Cathedral, and the imposing entrance gates of Gold Coast hinterland wineries, wrought iron takes pride of place in countless other homes and business. Wrought iron’s strength means it’s an all weather solution perfect for the local climate. Forget rust and rot that can plague timber and aluminium gates and fences. Each component has a protective coating and a strong core and virtually maintenance free. This means you can rely on the strength of your wrought iron fences, gates, balustrades or furniture to last a lifetime. From custom twists, decorative insets, symbols and symmetrical styles, each panel of your wrought iron is unique and can be personalised based on your design preferences. When coupled with other building materials including brickwork, timber, glass and steel, wrought iron can in and around a property can boost-street appeal and add significant value to a home, and make the right impression for businesses. Browse our galleries to see some of our award winning work and for more advice including a free consultation to find out how you can feature wrought iron in your home or business, call the iron experts at Dean Wilson Iron today.